Christmas is right around the corner here in Brighton and we can’t contain our excitement! At CW Interiors, we’re all about festive decor. So this holiday season, welcome friends and family into your home with a porch and yard that’ll give the North Pole a run for its money. Solar Powered Lights! No more untangling extension cords or dealing with expensive electricity bills. Unravel some solar-powered lights instead! They’ll charge all day and automatically light up when it gets dark out. Sparkling Presents. Standard porch Christmas decorations include garlands, wreath, and lights. We say, stand apart from your neighbors this year by mixing it up with some colorful presents! You can wrap them with bright colored wrapping paper and weave some lights into the ribbon for a festive statement piece. At the risk of pointing out the obvious, we suggest not putting any actual presents out on the porch (you don’t want the elements to damage those gifts!). Instead, simply wrap some empty boxes and maybe put a rock or something heavy in them so they don’t fly away if it gets windy. Hanging Baskets. Tired of hanging the same old wreath on your door year after year? 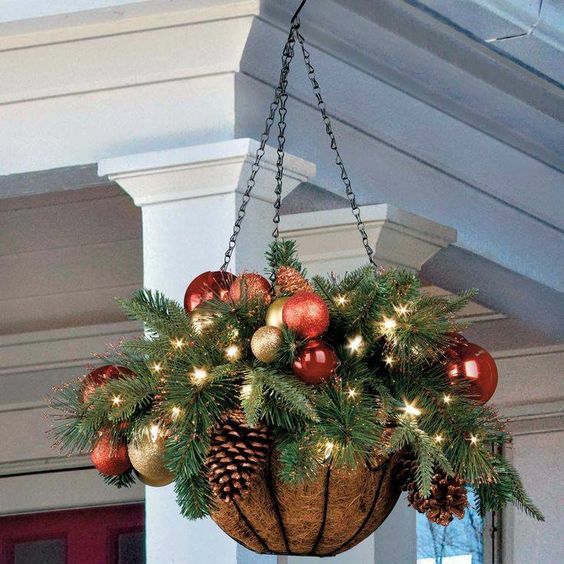 Change things up with a hanging basket of greenery, pinecones, and holly! It’ll add a splash of color and texture to your porch this holiday season. Prop up a Sled or Two. Don’t hide your sleds in the garage this year, instead let your kids leave them on the porch after they’re done playing outside. Lean them against your home’s doorway for a quick, but festive, Christmas decoration. Ornamental Flower Box. During the spring and summer months, many of us have flower boxes under our windows blooming with color! But then fall and winter hit and suddenly your flower box is just a box. Not anymore! This winter fill your barren flower box with brightly colored Christmas ornaments and lights! A Pop of Christmas Red. Brighten up your porch with red items such as rain boots, an old scarf, a painted lantern, a nutcracker and more. Accent it with gold lights and green garlands and you’ve got yourself a bold holiday setup for your entry way that will put anyone in the holiday spirit! Bring the Tree Outside. Rather than setting up your Christmas tree in the living room, set it up in your sunroom for a classic display that everyone can see from inside and out. Don’t have a sunroom or screened-in porch? That’s okay. String some leftover lights and colorful baubles on a tree in your yard for an outdoor Christmas tree that compliments the one inside. A Garland Archway. Greet your guests with an elegant, yet simple, garland outlining your doorway. If you’re feeling particularly festive, take it up a notch with dozens of red and gold ribbons and ornaments. Use Burlap in Your Decor. Outdoor decorations don’t have to be limited to your entryway. Up your mailbox game with garlands, pine cones, and a burlap bow! Mason Jars. They can be used for practically anything and everything under the sun, and they’ve become a DIY favorite as a result. Get festive and line your walkway with some mason jars wrapped in ribbon and filled with battery operated twinkle lights! You can use them inside too, and group them around your home for some holiday mood lighting. The holiday season is truly the most wonderful time of year! We especially love the opportunity to decorate and design with our friends and family. Follow us on Instagram @cwinteriorsbrighton and show us how you decorate for the holidays by tagging us and using the hashtag #cwholidays with your photos. We can’t wait to see what you create this year!